#107: Miscellaneous Music Ministries | mark Joseph "young"
This is mark Joseph “young” blog entry #107, on the subject of Miscellaneous Music Ministries. This continues our miniseries on what it is to be “called” to “music ministry”. Our first installment was #95: Music Ministry Disconnect, making the point that most Christians are not what we call “ministers” and most musicians are “entertainers”. In #97: Ministry Calling we examined how to know whether you are “called” to be a “minister”, based largely on who you are, what motivates you and how you relate to others with needs. Following this we identified five specific “ministries” in #98: What is a Minister?, and addressed each of these individually in its own article. Someone is undoubtedly saying that I missed something, because he knows that he is called to music ministry but does not fit into any of those. It is certainly plausible that there are ministries Paul did not happen to mention in that passage; he does not specify that it is an exhaustive list of possible ministries. On the other hand, they do provide comprehensive coverage of most of what we can identify as the spiritual needs within a congregation. If you have a spiritual ministry, what does it do? Does it bring the gospel to people who have never heard it and launch churches, as the Music Ministry of an Apostle? Is it focused on bringing God’s specific direction, timing, and confirmation to His people when they need it, and thus a Prophetic Music Ministry? Is it about bringing unbelievers to faith, an Evangelist Ministry? Are you drawing believers closer to God and each other, the Music Ministry of the Pastor? Are you enabling believers to understand the truths they have embraced, as a Teacher? If you are not doing one of these five things, what are you doing that constitutes spiritual ministry? On the other hand, there are other positions in the church, and we speak of other kinds of ministry today. The Ephesians list gives us a rather sweeping collection of spiritual servants, but as we previously noted there are other kinds of service within the church, and our use of the word “ministry” has been in a sense selective for our purpose. 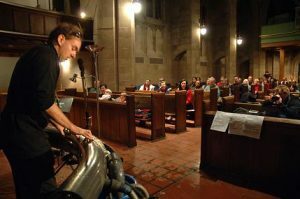 You might serve by playing the organ, conducting the choir, singing the liturgy, and be quite correct that God has put you in a place where you are using your gifts for His service. Some of those ministries have names; the degree to which music can be involved depends very much on how the position is understood. In some ways the simplest of those named positions is the previously mentioned diakonos or “deacon”. In Acts 6 there was a problem concerning the distribution of food–members contributed food to the church which was delivered to widows, among the poorest with the worst prospects at that time. The Apostles decided to have the church choose seven people to become “servers”, to deliver the food fairly to the women. Paul later discusses in letters to Timothy and Titus how to select such “servers” for the local church, and we assume that they have much the same function, of overseeing the in-house charitable assistance. We have expanded on that, but our expansions have gone in two distinct directions. In one direction, deacons have become the business managers of the church, because they handle the assets and spending; in the other direction, deacons (and particularly deaconesses) have become the charitable arm of the church, because their original assignment was to attend to the poor. Because of the tension between these two in some ways disparate objectives, the office has tended to become whatever the particular denomination or congregation wanted it to be, or even what the appointed individual made of it. It should be noted that being a server does not preclude being some other kind of minister. The Philip named among the seven servers is the one we discussed as Philip the Evangelist. It is also certainly possible that music can be incorporated into service as a deacon, as for example entertaining in a mission or soup kitchen, or at a concert to raise money for and awareness of the homeless or otherwise impoverished. The “presbuteros” or “elder” is more difficult. We know that there were elders in synagogues, and they were quite simply the old men who had been in attendance for many years. They had learned much and accumulated some wisdom, and so were sought to provide insight and direction. Nowhere are we told how they are selected or identified, but in I Timothy Paul suggests that they are in charge of “ruling” the church, and that they get paid for this (“double honor” refers to what we would call an honorarium, money given as thanks, and that it is “double” for those laboring in preaching and teaching suggests that those “elders” who are not preaching and teaching are still paid for “ruling” the church). He also suggests that some of them are involved in preaching and teaching–but that some are not, and thus again we have the suggestion that some elders also have other kinds of ministries, and also that some who do not have ministries of the sort we equate with standing in the pulpit are still very much involved in serving the church as leaders. That might sometimes include using musical gifts at church gatherings of one sort or another. Also unclear is the office of “episkopos”, a word compounded of “atop sight” giving us the concept of “overseer”. It is often rendered “bishop”, derived indirectly from the Greek (Greek “episkopos” becomes Latin “ebiscopus” becomes English “bisceop” and eventually “bishop”). We know that there is a selection process and qualifications; we don’t know what these people did. The title has become part of the hierarchy in many denominations, ranging from the head of a local church to the head of a denomination. It has something to do with ruling and caring for the house of God, but whether that means financial management or spiritual oversight is pretty much a guess. It thus also makes it difficult to suggest how music might fit into service in so uncertain a job. Some speak of a “healing ministry” and identify some persons as “healers”. The nearest word for that in the New Testament is “iatros”, which properly means “healer” but is almost always rendered “physician”. In most occasions it is used rather generally or often metaphorically about medical doctors. (The familiar metaphor is “Physician, heal thyself,” which is more poignant when we replace “physician” with “healer”.) The only specific individual ever said to be “iatros” is Luke (in Colossians 4:14, in passing as a way of identifying him). It is not impossible that Luke was a “healer” in the sense intended by those who use the term, but tradition has always maintained he was a medical doctor, and his writing supports this contention in several ways. Meanwhile, there is an interesting exegetical issue in I Corinthians 12:9. It is in the middle of a list of gifts the Spirit gives, immediately after “faith” and before “effecting of miracles”. We are very uncertain what many of these gifts are, but the quirk with healing is that it doesn’t say “healing” as a gift, but lists the gift as “gifts of healings”, as if perhaps this person received a package from God that contained healings he was to distribute to those who needed them. This person is not really exercising a gift of being able to heal people; he is working as a deliveryman who has been given these healings to give to others. That does not make it not a position of serving God and the church; it does significantly alter our perception of it. Yet as important as such physical healing is, our perception is that healings in the New Testament were always connected to bringing people to God. Thus those who have gifts of healing are probably also exercising one of the Ephesian ministries, enabled by these gifts, whether apostolic, evangelistic, pastoral, or one of the others. If music fits the “healing” ministry, it will be because it fits in the way that is appropriate to the ministry which the healing is supporting. Music is part of life, and has been from the early chapters of Genesis. It has been used in worship and in ministry, but was not invented originally for that purpose. We can have Christian entertainment, which is good, and we can use music in many ways within the church. I hope this series has been helpful to your understanding of ministry and the place of music within it.